Thunderstorms? Don’t they know it’s my birthday? For the past few years I’ve been fortunate enough to spend my birthday on Martha’s Vineyard with my best friends from home. We’re heading out tomorrow night to begin a long weekend of 24 birthday candles, lobster, sunshine, Mocha Mott’s coffee and, because Rachel is both mature and demanding, several applications of sunscreen. The forecast looks a bit grim (what’s the opposite of a rain dance?) but I am sitll beside myself with excitement. Last year we packed nearly 10 of us in what was in no way bigger than a 10×10 room. This year, we’ve booked some hotel rooms and Matt will (hopefully) not be obligated to force himself onto Rachel’s twin-sized air mattress with her. 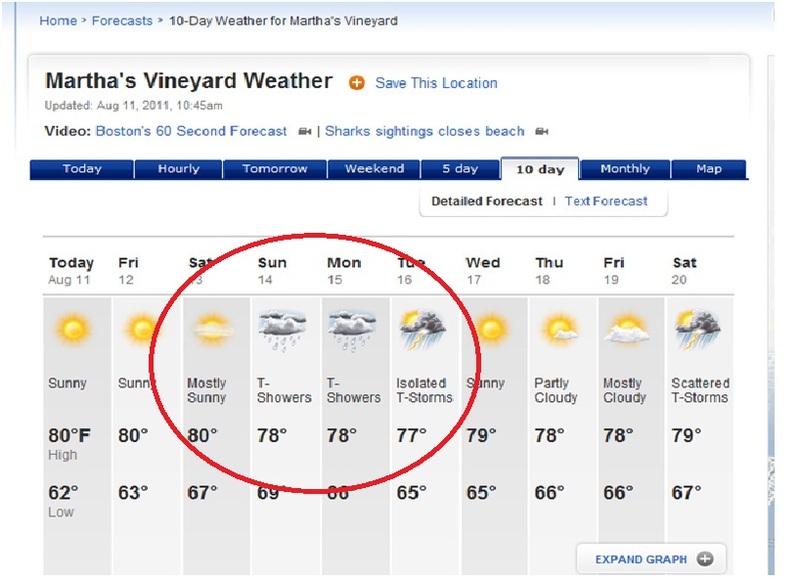 Have you been to Martha’s Vineyard? What are your favorite things to do while you’re there? With limited vacation days, it’s tough to get that time to yourself that you need to keep sane at work! Luckily, I’ve been able to take 3 mini trips this summer, which I almost enjoy better than one big one. I’ve already blogged about my trip to Chicago (my future cityyy!) and talked about what was then my soon-to-be trip to the Cape and Martha’s Vineyard. The trip was great! I drove down (or over or up? I’m not good with maps..) with my boyfriend on a Wednesday night after work. We stayed for two nights at a house in Dennis on the Cape that his family had rented for a week. After getting in at 1:30 in the morning, we got up at 6:00 and went deep sea fishing. Totally not my thing but ended up being AWESOME! After some beach time and amazing seafood my boyfriend and I left to hit the Vineyard for a couple of days with my best friends from home. To avoid the high-prices that are the Vineyard, we fit 8 of us into a tiny 10×10 room with two twin bed and a couple of air mattresses. Tight squeeze but it was hilarious. We walked around, shopped a bit then got some seafood and hit the bar for my 23rd birthday celebration. We did so much more but the details probably won’t interest you! It was a much-needed and much-appreciated trip. Hope you’ve had a few like that this summer!